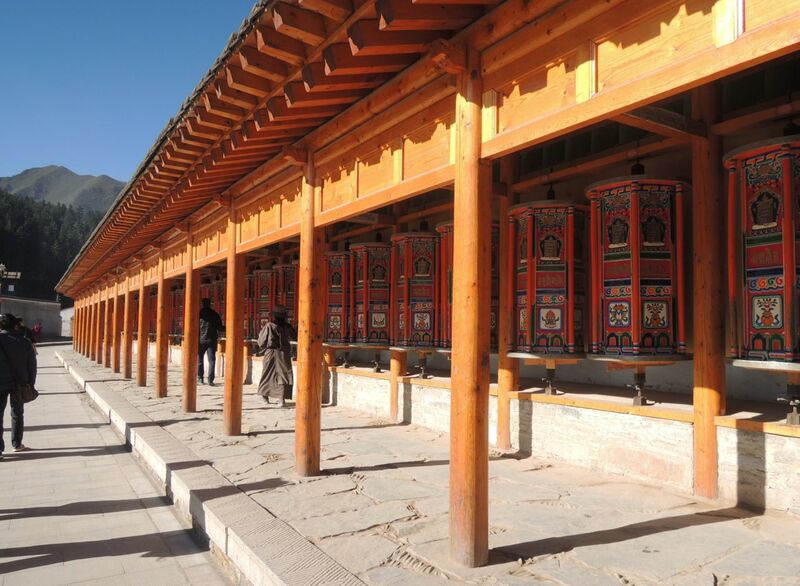 In Xiahe county, Gansu province is Labrang Monastery, home to the largest number of monks outside the Tibet Autonomous Region, about 2,700. It's a large compound that doubles as a tourist attraction, and so the monks must get used to tourists gawking at them or taking pictures or video of them. The monastery was founded in 1709 and is Tibetan Buddhism's most important monastery town outside of the Tibet Autonomous Region. 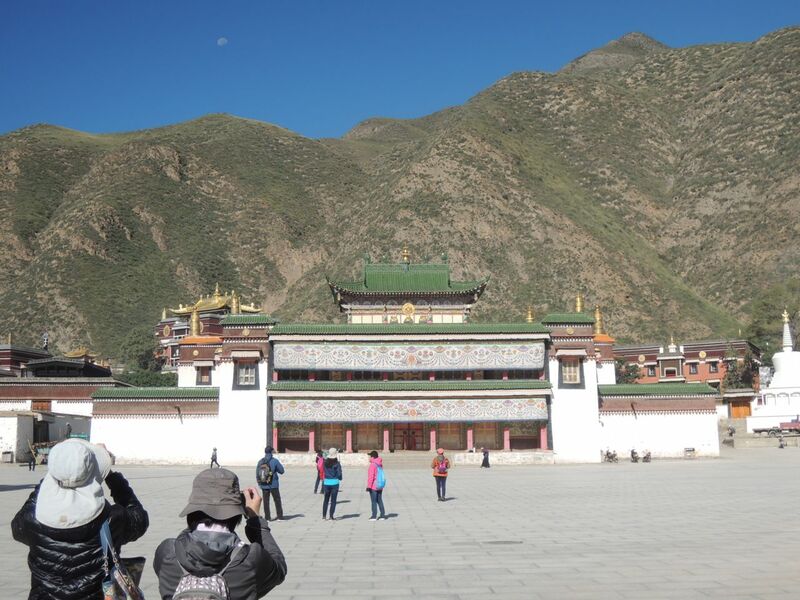 What also makes this particular place interesting is that it is the intersection of Tibetan and Mongolian cultures. It was and still is a place for education. Previously several thousand monks attended university here, now the numbers have dwindled to about 1,000. Monks can study subjects such as painting, medicine, philosophy and astrology. For medicine, they have to study for 15 years, learning about the various herbs and their medicinal benefits before they can treat patients. As we toured the various temples, there were Tibetans, most of them women, wearing masks, hats and colourful outfits as they made their pilgrimage to the temple, praying in the hopes their loved ones would get better. They would do this for hours, and one devout woman even wore knee pads as she kneeled on the ground, then with pads on her hands, prostrated herself on the ground, then stood up, took one step forward and again kneeled down and lay flat on the ground. An elaborate sculpture made out of yak butter! 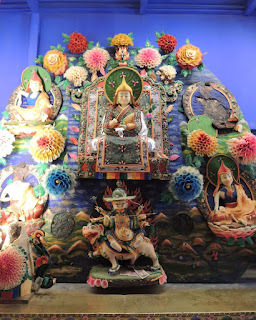 Another room was filled with random objects that were given to Tibetan Lamas, from books to porcelain, to paintings, ivory carvings, robes, furniture and a globe. They didn't look nice enough to be in a museum, which is what this room was, but the monks were probably proud of receiving such gifts over the decades and centuries. Another observation is that the monks here have a ruddy complexion and some look portly too -- that's because they do eat meat. However they are modestly dressed, except when they attend prayers. They all arrive at the largest temple in the compound -- which seats some 1,000 people -- and they wear a golden-coloured headdress that matches their robes. 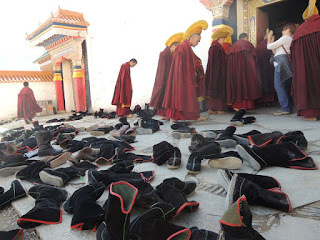 We saw them outside the temple, taking off their black boots before going inside, and they just randomly left their footwear there, which made us wonder how they would know whose pair was whose?